This course is being updated and will be live shortly. Request to be alerted when the course is ready here. This course carries 8 hours of Continuing Professional Development (CPD) credits. ■ Use Voice Record Pro app to capture sound. ■ Shoot and edit visual sequences with your smartphone. ■ Describe the different types of mics used for interviews. Hello. I’m Glen Mulcahy, the innovation lead with RTÉ, Ireland’s national public broadcaster. 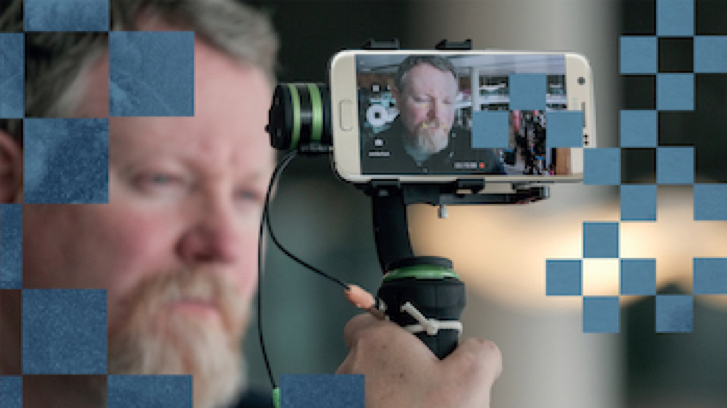 I lead RTÉ’s mobile journalism project (“mojo”) and I founded RTÉ MojoCon Ireland - the first international mobile journalism conference. I have trained more than 1,500 journalists in Europe, the Middle East and the United States, across television, radio, print and online. My specialities are Mobile Journalism, Video Journalism, DSLR Film Making and Photography. I am at the forefront of engaging with new technologies and working up solutions for how such technologies can transform the way traditional media organisations work. ■ Section 2 describes the first element of MoJo - creating images with a smartphone. You will find techniques to create powerful images. ■ Section 3 describes the audio element of MoJo and demonstrates how different apps and microphones can be used to record an event. ■ Section 4 explains the last element of MoJo, which is capturing videos. It also introduces video editing apps. You will be given a practical exercise based on the concepts discussed in the course. To do the exercises, you will need a smart phone. A microphone and a tripod are also desirable. You will be able to complete this course within 8 hours across multiple sessions including live Q&A with Glen Mulcahy on the Journalism Now platform.